We all want a magnificent home that stands out amongst the rest. However, we also want a villa that blends with its natural environment and neighborhood. Designing the exterior of a home can be a complex process of color choices, materials, and balancing shape and lines. It’s an overwhelming and exciting experience for designers and homeowners alike. So, we’ve put together a few basic exterior design principles that will help make your home a haven with a visually appealing exterior. As will all types of design, balance and symmetry play an essential role in achieving a well-designed exterior. Every home requires some semblance of balance and symmetry to create an aesthetically pleasing design. It may be the eye-catching allure of a symmetrical contemporary home, where the windows are large or a smaller front door with smaller windows. It could be a home where the balance is achieved through roof lines and outdoor pergola elevations to balance the heights. Regardless of your home style, there are a variety of ways to accomplish an exterior that is proportional to your home – some through obvious symmetry, while others are a bit more subtle. Either way, a properly designed home has an exterior that is proportional and balanced. Louis Sullivan, Frank Lloyd Wright’s mentor, invented the phrase, “form follows function”. Essentially, this means that the purpose of the building should be the foundation of the design. When designing your exterior consider the following: What is the purpose of your villa? What do you plan to use your home for? Consider your family needs and then decide what is required in your home (or yard) to accommodate those needs. Ultimately, The exterior of your home will mimic the form of the interior designs that you have chosen. With the surplus of options, it can become overwhelming deciding what materials you should use on your home exterior. Between wood, marble or flamed granite, aluminum, steel, Porcelain, paint , and natural concrete finish – how do we make our final decision? It’s always best to balance durability with aesthetics. Naturally, you want the exterior of your villa to reflect your personal style. For example, if you prefer a rustic look you may want tumbled crazy cut stone stone and wooden bark. If you are a modern minimalist, you may prefer the lines of sleek steel or simple wood panels. At the end of the day, stick with the theme of your home and what blends best with the natural environment. Landscaping your home requires far more than simply planting a tree in your backyard. When designed the right way, your yard will become an extension of your home and personal tastes. From gazebos and pergolas to living walls and custom water features, your yard should be a peaceful retreat for you and your family. Don’t let your yard fade into the darkness when the sun sets. Proper lighting is essential for home safety and nighttime appeal. Choose lights that mimic the style of your home. For example, traditional villas look fantastic with lantern-style chandeliers hanging over a covered entrance, or flanking the garage. Modern homes look amazing with angular steel lights. Not only will these custom lighting fixtures look beautiful, but they will also keep you yard lit and functional into the wee hours of the night! Looking for a few more landscape ideas? Check out our 10 Tips to Enhance your Landscape Design. Spending time outside with our family and friends dining and entertaining is a fun and memorable experience. Yet, dining al fresco is only part of the fun! Outdoor kitchens and living areas are an amazing way to add value to your home and quality to your life. An outdoor kitchen or living area allows you to cook, eat and entertain comfortably in your backyard. 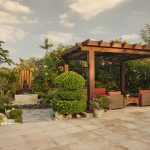 Between pergolas, gazebos, waterfalls, and fire pits, there are many amazing options to incorporate into your outdoor living space that will make it an essential part of your daily life. While the design of your home exterior can be a complicated process that is full of decisions and choices, a well-designed home can be achieved with patience and a little help! During the design process, we suggest that you follow the above mentioned tips and when in doubt consult a professional. The Milestone Design Team is always ready to help you achieve the home of your dreams!